The 3D printing method used to make the materials is known as stereolithography. The technique uses an ultraviolet laser controlled by a computer-aided design system to trace patterns across the surface of a photoactive polymer solution. 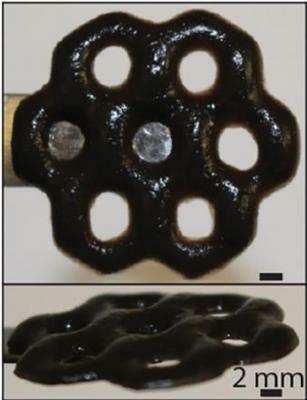 The light causes the polymers to link together, forming solid 3D structures from the solution. The tracing process is repeated until an entire object is built layer-by-layer from the bottom up. In this case, the polymer solution was made using sodium alginate mixed with sheets of graphene oxide. The extra stiffness enabled the researchers to print structures that had overhanging parts, which would have been impossible using alginate alone. Moreover, the increased stiffness didn’t prevent alginate-GO from responding to external stimuli like alginate alone can. The researchers showed that by bathing the materials in a chemical that removes its ions, the materials swelled up and became much softer. The materials regained their stiffness when ions were restored through bathing in ionic salts. Experiments showed that the materials’ stiffness could be tuned over a factor of 500 by varying their external ionic environment. “You could imagine a scenario where you can image living cells in a stiff environment and then immediately change to a softer environment to see how the same cells might respond,” the team said. That could be useful in studying how cancer cells or immune cells migrate through different organs throughout the body. Since alginate-GO retains the powerful oil-repellant properties of pure alginate, the new material could make an excellent coating to keep oil and other such substances from building up on surfaces. In a series of experiments, the researchers showed that a coating of alginate-GO could keep oil from fouling the surface of glass in highly saline conditions. That could make alginate-GO hydrogels useful for coatings and structures used in marine settings, the researchers say. “These composite materials could be used as a sensor in the ocean that can keep taking readings during an oil spill, or as an anti-fouling coating that helps to keep ship hulls clean,” the researchers said. The extra stiffness afforded by the graphene would make such materials or coatings far more durable than alginate alone.